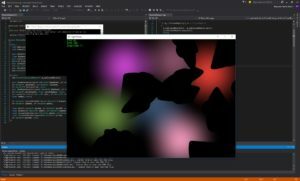 Mini2D was a game engine that I started creating initially to put into practise the content that I was learning in the Maths module of my Computer Games Programming course. Specifically, this was the intersection of various different shapes, and was more an exercise in creating a graphical collision system. However, I quickly realise that actually it wasn’t all that difficult to implement what was being explored in maths, so I moved onto a harder challenge. This resulted in me looking to implement a program that could run multiple different lights at once and cast realistic shadows on complex sprites at the same time. Mini2D is written in C++ using SFML as the graphics library. I didn’t ever get round to fleshing this out as a proper game engine due to university commitments, however the executable can be downloaded here. The repository containing all the code for the project can be viewed on GitHub here.